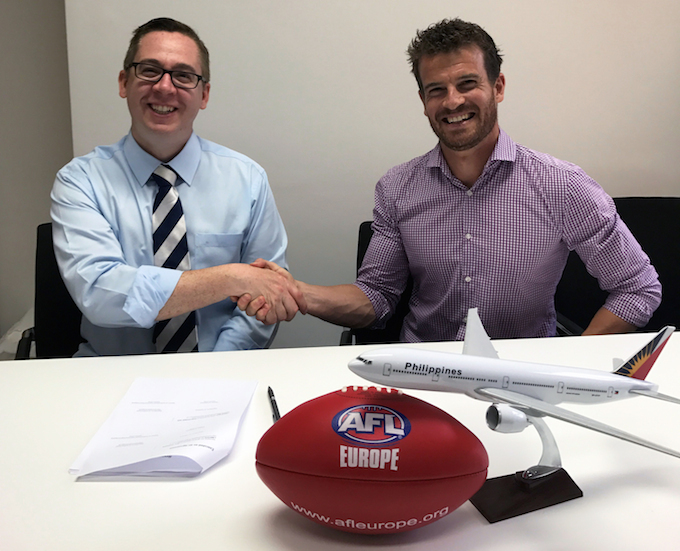 Philippine Airlines (PAL) will be the Official Airline Partner of AFL Europe in a partnership designed to assist the ongoing development of Australian Football in Europe, while supporting PAL’s own network growth. The partnership was announced by David Cochrane, country manager UK & Ireland of Philippine Airlines, Asia’s first airline and the country’s flag carrier; and Ryan Davey, general manager of AFL Europe, the representative body for Australia Football in Europe. PAL currently serves Sydney, Darwin, Brisbane, Cairns and Melbourne via Manila. Non-stop daily flights from London Heathrow to Manila allow its guests to connect seamlessly to PAL’s Australian destinations via its dedicated terminal.